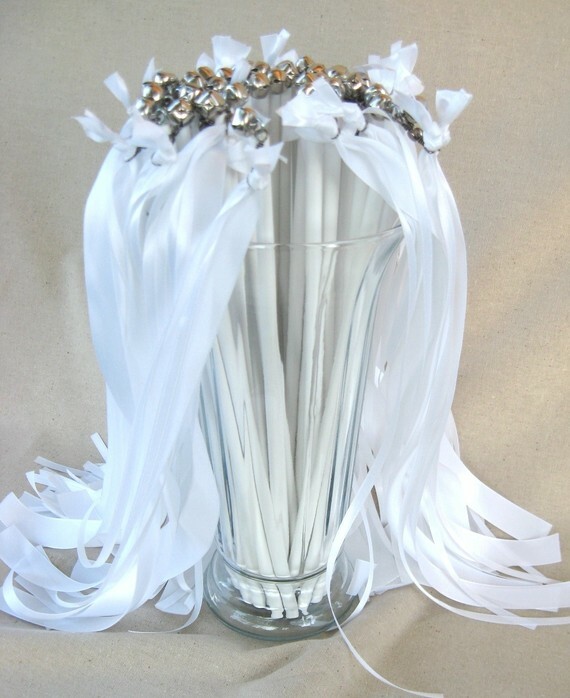 When trying to come up with the perfect party favor for any party theme, it can be kinda hard. You want to find something that the kids will enjoy, that won't go home into the "junk" toy drawer (you know we all have one full of McDonald's and Dollar store toys), and that they will remember that "awesome" party every time they play with it. I think today I did it! I'm sharing them with you! 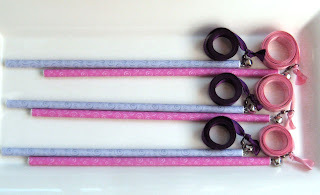 When I was searching Etsy for great fairy party finds, I found these amazing Ribbon Wands from A Girl and Her Needle. Aren't they the most amazing favors? I contacted the lovely owner of the shop, Charmain and asked if she could make me some in my party colors. She was so helpful and easy to work with. She found some pretty ribbon and made me these beautiful wands. I know the girls are going to absolutely love them! Each wand has a sweet pink or purple wooden 12 inch base with a fun swirl design on it. Attached to the top of the wand is a soft tinkling bell (great for encouraging other fairies to come play) and 6 feet of beautiful matching ribbon perfect for twirling around and dancing in a fairy garden. 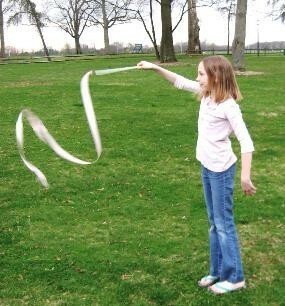 Charmain has thought of everything and attached the ribbon using a swivel to prevent the girls from getting all tangled up during play. Perfect for LONG hours of dancing in the sunlight. 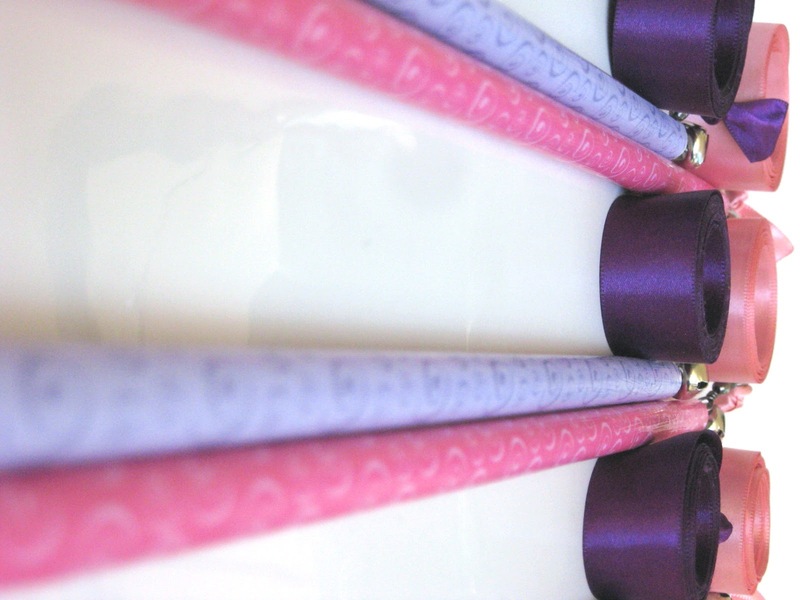 If you check out A Girl and Her Needle you can find Ribbon Wands in so many different colors and styles. 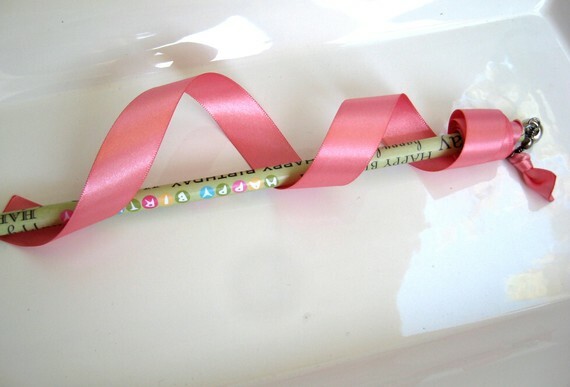 A Pink Happy Birthday Ribbon Wand perfect for giving as a birthday gift! This Fuscia Flower Ribbon Wand is one of my favorites because its so fun looking. Wouldn't it be great at a 60's Hippy Party or for a fun Spring Fling? 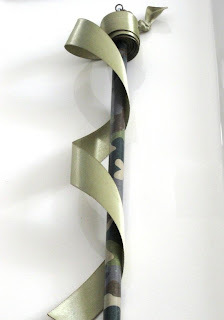 This Camouflage Ribbon Wand makes me SMILE...how fun is that? 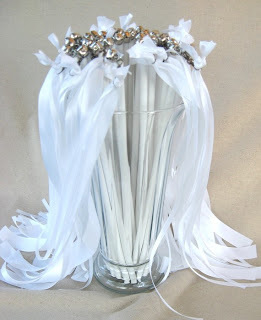 These Wedding Ribbon Wands are just beautiful! 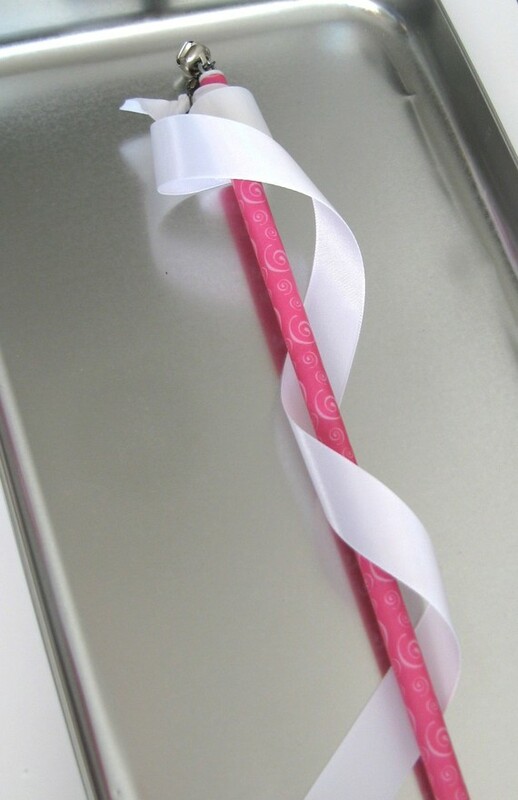 I just know my little fairy princesses are going to love these fun ribbon wands. I can already see them dancing in the garden with their ribbon wands and fun crowns flowing out around them. 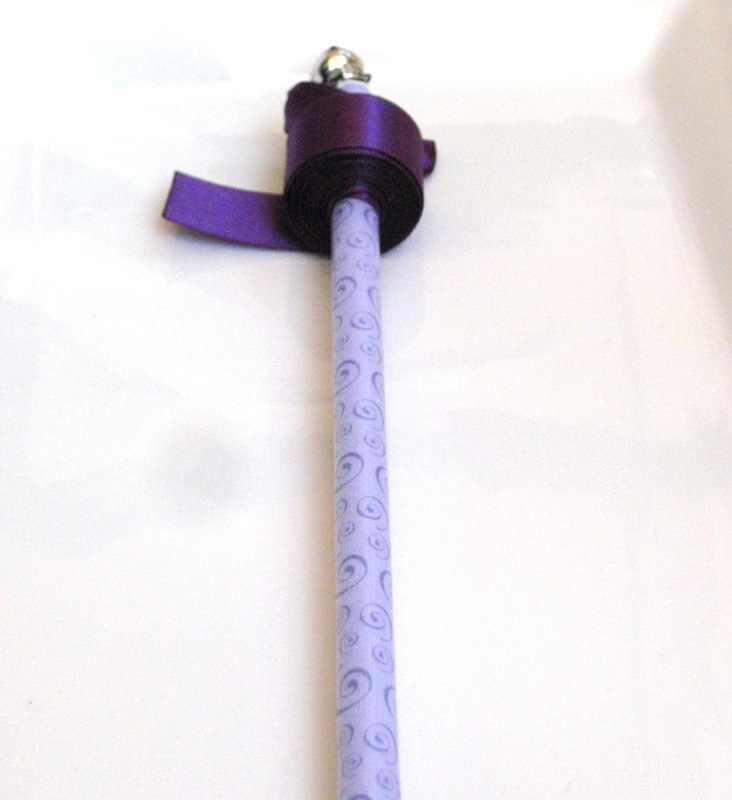 And because I'm so excited to share them, Charmain has agreed to let us give away one wand! One lucky reader will receive their own Ribbon Wand to enjoy! Simply leave a comment here letting us know which of the wands you would like. Visit A Girl and Her Needle's Etsy store and favorite her shop. Tweet Tweet about this to your friends and followers. Contest ends next Wednesday at noon (EST). GIVEAWAY NOW CLOSED. THANK YOU. What a smart idea! The Green Dot Candy is super pretty! I like the Pink Happy Birthday wand! I like the Teal Happy Birthday wand. like the fall leaves wand. 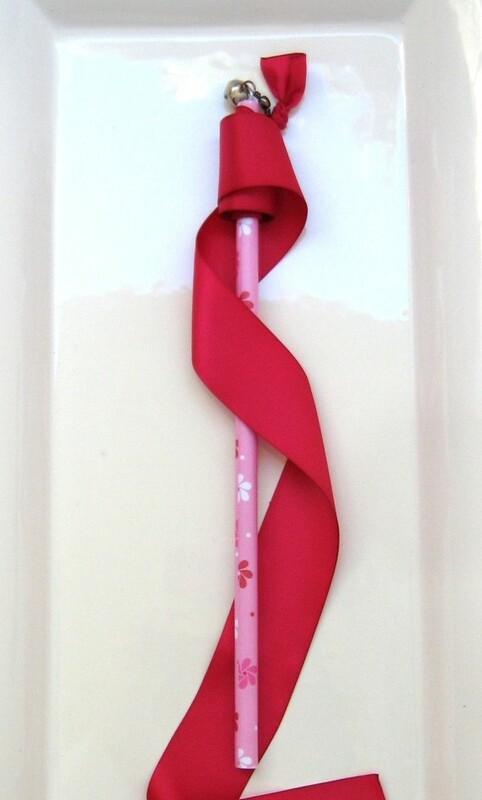 My favorite wand would have to be the Fuscia Flower Ribbon Wand! I like the Ribbon Wand - Pink Dot Candy.